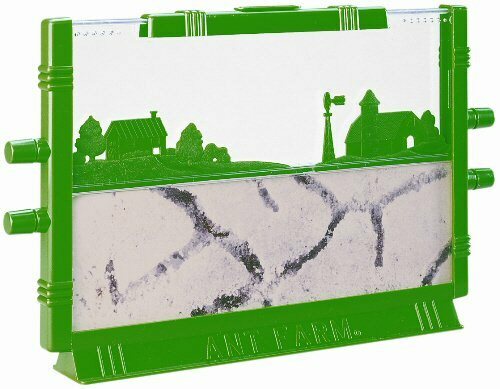 This is the Original Uncle Milton's Ant Farm, recipient of the Toy Institute of America's Toy of the Century Award. Novelty toy-maker Milton Levine came up with the idea for the Ant Farm in 1956. Up to now, over 20 million Ant Farms have been sold. The farm features an escape proof design, antports for connecting additional Ant Farms, and an extra-wide, stable base. Some of our visitors will remember having one of these as a child in the 1970s, in which case you will already know how fascinating this learning toy is. There is a certificate inside the box, which let's you send off for ants in the UK, however, it is FAR MORE fun for your children to go out looking for ants in the garden. Everything included, incluing sand - just add the ants! Ant Facts: If you could run as fast for your size as an ant can, you could run as fast as a racehorse. Ants can lift 20 times their own body weight. An ant brain has about 250 000 brain cells. A human brain has 10,000 million so a colony of 40,000 ants has collectively the same size brain as a human. The average life expectancy of an ant is 45-60 days. Ants use their antenae not only for touch, but also for their sense of smell. The abdomen of the ant contains two stomachs. One stomach holds the food for itself and second stomach is for food to be shared with other ants. Ants have four distinct growing stages, the egg, larva, pupa and the adult. There are over 10000 known species of ants. Each ant colony has at least one or more queens. The job of the queen is to lay eggs which the worker ants look after. Worker ants are sterile, they look for food, look after the young, and defend the nest from unwanted visitors. Ants are clean and tidy insects. Some worker ants are given the job of taking the rubbish from the nest and putting it outside in a special rubbish dump! Each colony of ants has its own smell. In this way, intruders can be recognized immediately.